Personally I do not believe in the paranormal. My Catholic upbringing has influenced me into thinking that psychics just tell stories and none of it is real. However, many people follow, listen to and believe psychics and the outside realm. In the new book, Born With a Gift, Live Your Life Through Your Gift, author Sasha Brisk explains how we can connect with our own universal gifts in order to live life stress free and be a better parent and spouse. I do believe that everyone has their own gifts. However, as a practicing Catholic my beliefs are very different from what Brisk explains in her book. I do believe in angels and that your loved ones are able to communicate with you after they die. But, for me the spiritual world is ruled by God Almighty and you can harness your intuition through prayer and listening to God’s message for you. Prayer and accepting Jesus as your savior will lead you to a stress free life. If you are seeking for answers that are beyond what the Bible teaches and what you hear from your pastor or priest during Sunday service, then Born With a Gift offers a new perspective on life and how you can connect to your natural gifts. 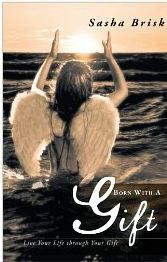 You can purchase Born With A Gift: Live Your Life Through Your Gift, by Sasha Brisk on Amazon.com or at your local bookstore. *Disclosure: I received a copy of the book, Born With a Gift: Live Your Life Through Your Gift, by Sasha Brisk in exchange for this review. All opinions are accurate and 100% mine. Related Should We Really be Celebrating Bin Laden's Death? Are you sabotaging your efforts?